In the spice cupboard we found we had a tiny jar of black winter truffles. These are cured in a brine and, as such, are not a patch on fresh ones, but at this time of year they are a workable substitute. We used a little truffle oil to lift their aroma. Whilst we cooked this dish using a water bath (sous vide), it will also work cooking in a bag made from tin foil (en papillote). Dice celery, onion, leeks (washed and rinsed), carrot, potato and turnip. Slice the truffle, mince 2 cloves of garlic and add two bay leaves. We rubbled a little truffle oil into the black truffles. Remove the poussin (Cornish Game Hen) from any packaging and pat dry with kitchen towel. Using your fingers pry the skin away from the flesh and in this pocket place the sliced black truffle. Place the chicken and the diced vegetables in a vacuum bag then add some salt and pepper. Vacuum and seal the bag then place in a water bath set at 147.2f (60.5c) and cook for 1 1/2 hours. Open the pouch, remove the chicken and set to one side. Place all the veg and juice from the pouch into a pan then add some white wine, water and a little cream then reduce. In a pan brown the poussin then remove the breast and slice. Once the vegetable sauce has reduced adjust the seasoning then place in a bowl. Season the chicken and place the sliced pieces on top of the sauce. Chiffonade some spinach or upland cress and sprinkle over the dish. Drizzle a little olive oil over the top and serve. The perfectly cooked chicken is given such a wonderful earthy flavour from the truffles. 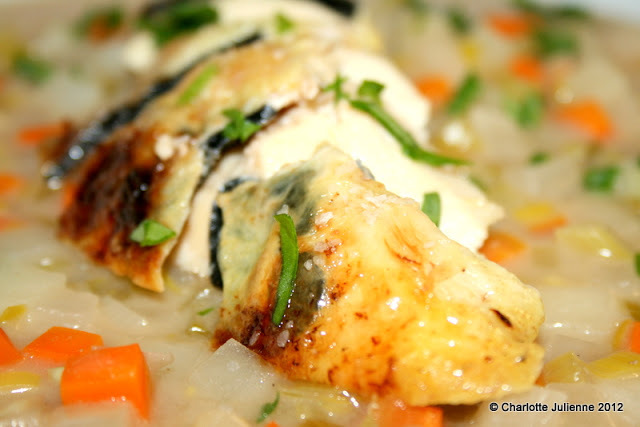 The vegetables and the broth are light and tasty and bring the whole dish together.